It’s time for everyone’s favorite post of the year: the Mysterium kickoff! If you missed our previous announcement, we are excited to bring Mysterium back to the home of Cyan — Spokane, WA — for Mysterium 2019. This year’s Mysterium will be chaired by Taniith. Mysterium 2019 will be held on the first weekend of August, running from Friday, August 2nd through Sunday, August 4th. We have many exciting events planned for you all this year. However, in order to accommodate everything, we have decided to extend Sunday’s schedule. This year, Sunday (and, thus, the Convention) will end at 4 PM, giving us about four more hours for activities. We want to make sure everyone is aware of this change before you begin making travel plans. Please be sure to spread the word! It’s hard to believe, but this year marks 20 years of Mysterium! As such, we felt it would only be appropriate to make Mysterium 2019’s theme: “Mysterium Through the Ages.” We’ll also feature some additional elements from Ahnonay. Who doesn’t love some time magic (and quabs)? We are truly honored to have reached this landmark. It’s incredible to have such a dedicated and passionate community. Without your participation, we wouldn’t be here today. As such, we plan to pull out all the stops and make this a Mysterium to remember. We already have events and puzzles in the works, Cyan has confirmed that they will be involved in this year’s convention (including a visit to Cyan HQ), and we are reaching out to a few “special guests”… but that’s another blog post. We’ll even take high-res photos of shirts from 2000-2007, if that’s all we can get. Thank you in advance! Speaking of logos, Mysterium 2019 Logo submissions are officially open! We encourage you to integrate the number 20, “Mysterium Through the Ages,” Ahnonay, Spokane, or Cyan in your designs. More information about the design requirements and submission process can be found on the Logo Contest page. Submissions are due by by Friday, January 4th. If your logo is selected you will receive a free Mysterium shirt, and possibly some other swag too! Logos aren’t the only artwork submissions this year! The fabulous Kelly/Rayne has begun spearheading a project to put together a coloring book for attendees. We also plan to make several new exclusive enamel pins for next year. We’re trying to stagger artwork deadlines, so stay tuned for more details on how to submit artwork for those in the coming weeks. Be sure to follow @MysteriumCon on Twitter, the Mysterium Facebook Page, or our Discord server for Mysterium 2019 and Mass Mysteria updates. We have a lot of awesome things planned for our 20th anniversary, and we can’t wait to share more with you over coming weeks and months! We’ve had some exciting announcements in the Myst community that will make for some exciting buzz at this year’s Mysterium. If you haven’t already seen the news, Cyan announced the Myst 25th Anniversary Collection on Kickstarter. Our amazing community fully funded the project within eight hours and is rapidly approaching 4x the original goal. The Collection includes some impressive and unique backer rewards, so if you haven’t yet seen the project or backed it, follow the link above and take a look. Early-Bird Registration and t-shirts are still available. If you missed our t-shirt announcement, head over to our T-Shirt Page to learn more about this year’s design. We’ve also added a sizing chart. When you’re ready to register, head on over to the Registration Page to get started. Be sure to visit the Location Page for more information about our hotel and how to make reservations. As always, Mysterium wouldn’t be what it is today without our fans. If you have an idea for an event you would like to see or host, we’d love to hear about it! We’ve received some excellent ideas so far, but we’re always looking for more. Take a look at the Events Page to learn more and submit your ideas. We’re happy to work with you to make your idea a reality! All of us on the Mysterium Committee can’t wait to see everyone this year. We have some fantastic ideas in the works and can’t wait for August to arrive. Mysterium is approaching fast and furious, so be sure to check out the Mysterium Discord server to connect with fellow fans, attendees, and staff. You’ll find this year’s room and ride share discussions there and might also be able to find a fellow fan to host an event with. We know we’ve been quiet lately, but we have been hard at work getting everything in order for Mysterium 2018. We have a lot to announce, so let’s get started. We are excited to announce that our hotel has been selected and is ready to accept reservations. Mysterium 2018 will be held in the Holiday Inn St. Louis – Downtown Convention Center, located only a few blocks away from The Gateway Arch! We have secured an exclusive rate of $119/night, which includes a reduced parking rate of $5/day and complimentary breakfast. For more information about the hotel, booking and extending your stay, and transportation options, please visit our Location page. The logos from Mysterium 2018 have been selected. We received several entries and picked the two we felt best represented our theme this year. This year’s front design was created by Drew and represents everyone’s favorite slider-based sound wave puzzle. The back design was created by laughingpineapple and combines Selenitic’s maze sounds with Stoneship’s compass rose. The shirt will be navy blue and available in Small to 3XL in both unisex and women’s cuts. 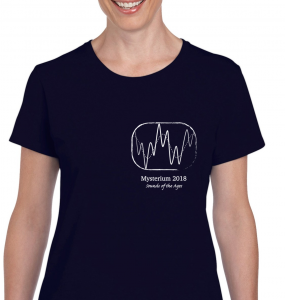 If you will be attending Mysterium 2018, you can pre-order a t-shirt right now with your registration! Please note that shirts are only available on-site. Unfortunately, we are not able to ship shirts under any circumstances. T-Shirt pre-orders end June 8th. 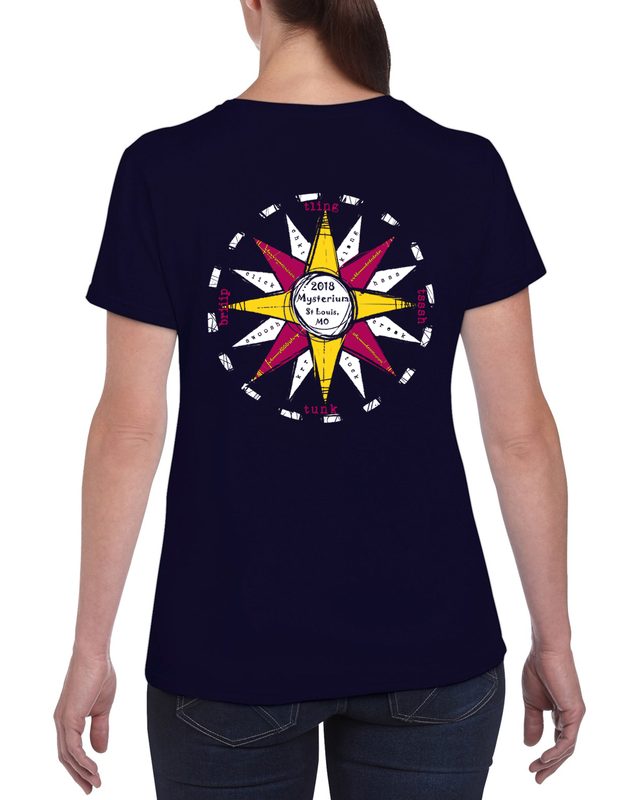 For more information, please see our T-Shirt page. 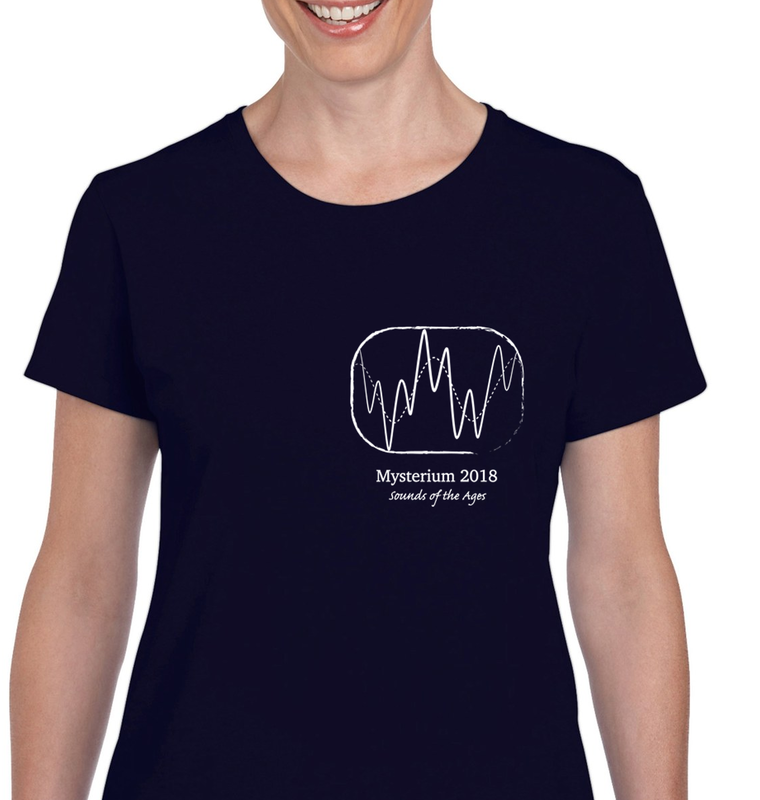 And now, for the big announcement we’ve all been waiting for: Registration for Mysterium 2018 is now open! Until June 8th, you can register for the entire weekend for $25 or register for the full weekend and a t-shirt for $45. After June 8th, prices increase and shirts will no longer be available to pre-order. For more information, and to register now, check out our Registration page. We’re looking forward to seeing you all this August!